Listen up, guys. This is the moment we've all been waiting for, the answer we've been hunting down since we found out the game had been stolen from Mona way back when. Now all I'm saying is that I spent 142 hours watching this show for.... that? Let's just get right down to it. We see the girls racing onto the roof and pleading with A to step down off of the ledge. The cops have surrounded Radley and are ready to take A down. We see A’s arms go up and… does he or she jump?! Thank God they didn’t let us know what happened right away, am I right? Sheesh. We go straight into flashback mode and return to where we last left the Liars: at prom. The girls have been trying to call Ali at home and as the phone rings at the DiLaurentis house, the moms are still banging on the door of the basement. (Please tell me someone let those ladies out between the end of the present and the five-year time jump!) Someone in a red cape stalks by at prom, and Aria catches sight of them. “There’s no way out of here, Aria,” the girls insisted. Okay, well, I didn’t believe that and I surely don’t believe it when a doorway opens allowing the girls to leave the inexplicable prom maze and come face-to-face with who Aria had spotted before. The mask is removed and it’s Mona. She’s so dramatic sometimes. But at least that answers the question of who was following Ali through the bushes before the dance started. Mona explains that she had been tracking Ali for the last few days but had lost sight of her thanks to Ezra and Toby jumping Clark. The Liars ask if she can find Ali again, and when Mona tries, she realizes that Charles has his own cellular tower and that it’s located right at the Carrisimi Group. Of course it is. Hanna was right all along, but we could have foreseen that. But could we have foreseen A dragging what appears to be Jason’s dead body along a hallway? WE COULD NOT. Ali wakes up in Radley, surrounded by photos of her family and a little girl’s mannequin in a yellow top. As she looks around, she sees her dad lying on the ground behind bars. Is he dead? Would A not only kill Jason but Papa D as well? That seems a bit rash to me. The girls pull up outside the Carrisimi Group’s building and see the cops there. They place some duffels in a van and drive off allowing the girls and that annoying tag-along Sara to go inside. When they get upstairs to where Mona directs them, they can’t seem to crack the keypad. They try birthdays and it doesn’t work. Then Sara pipes up and says that when she was down in the bunker, A gave her a red, white and blue cupcake on a certain day each year, but it wasn’t Fourth of July. She had tracked all of her days in there and she knew it was September 7th. What was so significant about that date? Either way, green means go and the girls walk into what can only be described as A’s brain -- a room full of non-2015 technology and a colossal touch screen control panel. When they ask Sara why she’s hanging back, she says that it’s a little cramped... just as the door slides shut. A giant projection pops up against the wall and the girls are treated to a video of Ali. Mona tries to figure out what’s going on and explains that they’re watching a live-feed. Ali is looking down at her dad and Jason and the girls also wonder if they’ve been killed. Ali asks the black hooded figure staring out the window what she did to him/her and when A finally turns around, we come face to face with… IS THAT CECE?! Is Cece A or is she just part of it? And how did Sara get roped into this? WHAT IS GOING ON?! “How could you do this to me? I risked everything to help you!” Ali screams at Cece. She gets in the camera and sings "Lord help the mister who comes between me and my sister." There are SO many questions, which is typically of Pretty Little Liars. First though: does Cece think that the girls came between her and Ali? The Liars wonder where Tanner is and then question if she was also in on the game. In the cell, Cece explains to Ali that she remembers being so excited when Ali came home. “You were like my own living doll.” Okay, so. Cece is Charles? I’m going to need a little bit more information here, folks. There’s a flashback to the very scene Papa D. had described with Charles putting Ali in a scalding bath, but from Charles’ perspective, he was just trying to calm Ali down and he accidentally dropped her. The flashback shows that Papa D. comes in and asks what’s wrong with him. The next thing we see is Jessica dropping Charles off at Radley. Papa D. doesn’t feel as bad as Jessica does, because he knows this isn’t the first instance where Charles has done something troublesome. He thought it was the right thing to do; Jessica didn’t seem to be that convinced. Cece continues to tell her story and explains that she loved to play dress up in their mom’s closet. Their dad would have been furious if he found out, so he and Mama D. kept it a secret. But whenever Jessica would buy an outfit for Ali, she would buy the exact same outfit for Charles. We enter a flashback of Bethany and Charles on the roof of Radley (Which, uh, is that a casual hangout? Are they just allowed to do that? And you wonder why the place had tons of problems with patients.) as Charles spins around in a white dress and orange scarf. The two make a plan to leave Radley and determine that the leaving is easy -- the staying gone is the hard part. “We just need to come up with a good story. Something fabulous and devastating at the same time,” Charles says. They hear a door opening to the roof, and Charles asks Bethany to cover for him, that no one can see him wearing girls' clothes. Out walks TOBY’S MOM (seriously, is no one watching the roof of this place?) and we see Bethany talking to her and then SHE PUSHES HER OFF OF THE ROOF. BETHANY PUSHES MRS. CAVANAUGH OFF OF THE ROOF, YOU GUYS. Remember when Toby said nothing added up about her “suicide”? Yeah, it’s because she was pushed. And this is why the roof needed roof guards. Talk about a seriously dysfunctional family, AM I RIGHT? After that incident on the roof, Charles got a new diagnosis that was more suitable for Bethany. Ali apologizes for everything that happened to Cece and I’m like SERIOUSLY? The Liars and I agree: how could she apologize to Cece after LITERALLY EVERYTHING THAT HAS BEEN DONE TO THEM? Anyway, Radley allowed Charles a day pass and Jessica had a mock funeral for him at Aunt Carol’s. He thought he was going home, but instead, he was sent back to Radley under the name Charlotte. A motion sensor goes off in Charles' giant brain/control room, and the girls see that Ali and Cece are at Radley. The camera pans to a hallway and they see RED COAT walking down the hallway. “I thought Ali and Cece were the only red coats?” It's then that they notice what Red Coat is doing. Back in flashback land: Mama D comes to visit the now-Charlotte and says that the board is allowing her to take classes at the University of Pennsylvania. Cece reveals to Ali that she had fun for a w hile, but then got bored with classes because she already knew everything being taught. She says that she called in a bomb threat to get classes cancelled one day and, on her day off, went to Rosewood to catch a glimpse of her family. There, it’s picture day at Rosewood High School and Cece sees Jason getting his picture taken. He, meanwhile, notices and is immediately taken with her. She introduces herself as Cece Drake. So yes, everyone, Cece DATED HER OWN BROTHER. She reveals to Ali that it was weird dating her brother (and the audience is like, yeah, duh) but that’s why Jason was always frustrated; they clearly had never overstepped boundaries. Cece tells Ali that no one knew it was her Jason was interested in until the family trip to Cape May. (If she only had clearance for classes a few days a week, HOW DID SHE STAY IN CAPE MAY FOR THE SUMMER?) Jessica was obviously furious and said she thought she was taking classes, not gallivanting around Rosewood with Jason. She said they couldn’t say anything to Papa D.
It seems Mama D left out that small little nugget of story where she told Papa D. that Charles was actually dead. “You told him that grave was real?” Cece asks, exasperated. She accuses Mama D. of burying her secret with that grave. Ali is clearly hurt during this whole ordeal, tearing up as she says to Cece, “We were so close. Why didn’t you just tell me the truth?” Cece reveals that wanted to, but Bethany was the problem. She angry that Mama D. was having an affair with her dad, so Bethany stole all of her clothes and was headed after the DiLaurentis family to hurt them. It seems the Wilden was on the wrong side of the law even before he met the girls because he not only took money to change the details of Mrs. Cavanaugh’s death, but he also took money to cover up why Cece was out of Radley. My question is, if he already knew all of this prior to meeting the girls, why was he always on the girls for answers? Did Cece kill him because he was fed up and was going to give her up? She explains that she was always looking for Jessica’s forgiveness. As Mona continues to find a way out of the panic room, she notes that Cece is like the "real wolf of Wall Street," and that she never made a bad investment. Now we know how she was bankrolling all of the game. A picture of Rhys pops up on the screen and Spencer notes that he was hired as a stooge to throw the girls off and he didn’t even know it. But how did Cece rope him into changing out the photos at Aria’s gallery, I wonder? Cece tells Ali that Radley obviously took away her out privileges (explains why she was “tossed out” of UPenn when she offered to help Spencer get in). When she heard why Mona was brought in, she often visited her in her drugged-up stupor in order to pull up information about how she played the game and the girls that turned on her sister. My problem with this flashback is the fact that Wren had to override Mona’s visitor restrictions to allow Cece in WITH A BADGE. Why would she need a badge if she was already at Radley? Cece says that she was bummed when they weaned Mona off of her meds because her stories were Cece’s favorites. Cece reveals that she had to stop seeing Mona in Radley because she would never trust a girl who would run over her best friend with a car for the sake of a game. But she also knew that Mona was astounding at getting in and out of places, so they cut a deal: if Mona could get her out, she would help Mona with the game. Once she was out, she needed to make friends at Rosewood and targeted the girls. She was doing her “best Ali impression” at the coffee shop on the day they all met and revels in the fact that the girls totally ate it up. It turns out that someone was sending Mona riddles around the same time that Cece started seeing a blonde girl in a red coat following the girls which means the original Red Coat was neither Cece nor Ali. This is a good time to pan back to the Red Coat back in the hallway setting up explosives and when she turns around, who is it? SARA HARVEY, THAT’S WHO. If you recall, not only did I know she was sketchy, but I also called that she was Red Coat during the gallery episode. I knew that there was something fishy about her not having a tracker in her neck despite being down there with the girls. But the question is: how does she fit into the game? As in how did Cece come across her? She couldn’t JUST be a decoy because she knew about Mona looking to spot Cece and obviously knew the whole backstory. Cece found out Ali was alive because she overheard Mona telling the girls that she had pulled them from the cabin. Back in flashback-land: Wilden had found out that Ali was alive. Cece knew that he would never let her come back and tell her story. We flashback to his funeral and watch as the girls ask who the woman in all black is. She steps into a limo and when Cece asks if she saw the body, she pulls back her veil and IT’S SARA. SARA IS ALSO FREAKING BLACK WIDOW. Cece wanted to make sure he was dead so he could never hurt her sister again and Sara assures her he’s dead. Okay, so Sara was never really missing unless Cece kidnapped her. If she wasn’t’ really missing though, how was it possible for her to just dip out on her life like that? How could she allow everyone to think that she was dead? I told you that things were off with that one. Cece apologizes -- the ultimate #sorrynotsorry -- to Emily directly into the camera and honestly, Em? Your surprise at this point in the juncture is not amusing. Mona shuts off the live feed as the girls discuss Sara coming out of the dollhouse. I mean, come on. Mona was in there how long and knew the layout of the place but somehow didn’t see Sara? RIDDLE ME THAT ONE. Homegirl probably just rolled around in some dirt to look grimy when the fire started and realized the girls were getting out. Rude. Cece, in the flashbacks, returns to her home to tell Mama D. everything that has happened but when she arrives, she sees Jessica dead in the yard. Okay, so if Cece didn't kill Mama D., then WHO DID? She obviously buried her, but who killed her? In the present, an alarm trips at Radley, announcing the girls’ arrival. They find Sara and she tells them to get out as she readies the bomb. Why does Sara hate them so much that she’s willingly part of this whole game, and why, exactly, does Cece want to blow up the family that she fought so hard to get back? The red light on the detonator lights up, Cece pushes it... and nothing happens. Spencer obviously knows how to diffuse a bomb and saved them all. (Related: Spencer and Mona need a spin-off. I'm just saying.) Sara says that she tried to keep Emily safe, but Emily punches her in the face instead. You go, girl! We’re back where we began the episode, and Ali is screaming, “PLEASE, DON’T DO THIS, CHARLOTTE!” Instead of jumping off the building, Cece jumps back down onto the roof and says “game over.” Okay, but I still kinda feel like it’s not. It’s now Labor Day weekend (look at how everything comes full circle) and the girls are packing up their cars to go their separate ways; Savannah, DC, Malibu and New York City. They got into some great schools and that's honestly the biggest mystery of the entire series because we rarely saw them studying and they were never in school. So kudos. 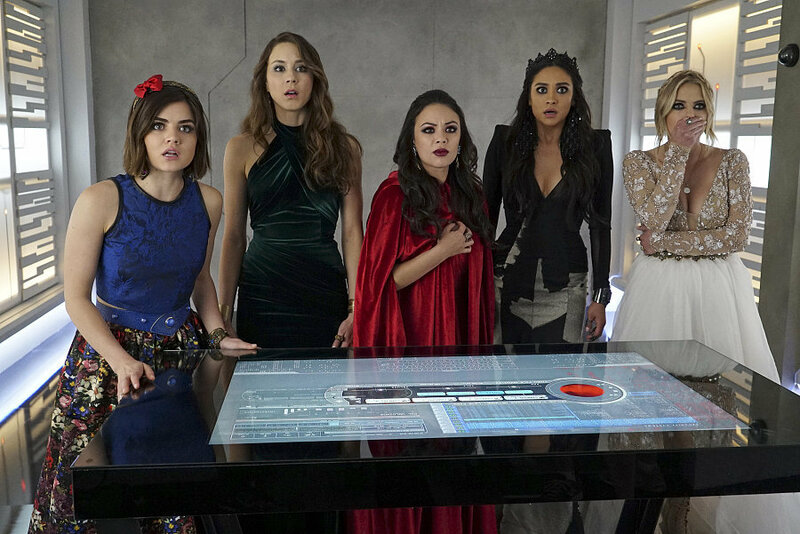 Aria can’t believe that they’re actually able to leave Rosewood with the A mystery behind them. Emily, meanwhile, reveals that Sara was released from the hospital and Ali reminds her that what happened to her that night was not their fault. Ali bids them all farewell as she’ll be staying in Rosewood. It's a sad moment watching all the cars pull away and Ali wrap her sweater around herself, watching them go. Remembering that Ali was the one who brought them all together and now she's the one they're leaving behind is kind of moving. And then... we get a time jump! It’s now five years later. Ali is writing her now-married name on a chalkboard at Rosewood High School when the girls run in one by one saying that they have to go, that he’s coming, that they all came back to Rosewood to protect her. Spencer says it’s too late and that he’s already there. Who is? What’s going on? What fresh new threat is this? Based on the five years forward previews, we gather that it’s been hard for the girls to lead fully functioning lives after the ordeal that they’ve been through. While they seem successful, they still have something holding them back. It also seems that someone else is now on their tails and ready to wreak as much havoc as possible. Who could they be running from? Who could have something against them now? Was Cece actually Bethany (who was known for pathological lying and was best friends with Charles) and now Charles is seeking revenge? I feel like this was a total letdown, to be honest. If they had made Wren, like I had originally predicted, A, it would have been much more shocking as he was an outsider who kept trying to weasel his way in. This felt almost like a cop-out for A to be Cece. Apart from one clue of Cece wearing the clothes the girls found in a shopping bag in Ali’s closet, I can’t recall anything else that would have given us any indication. Especially since it seemed like she was helping Ali save the girls when they were running around in the red coats. A lot of the story still doesn’t make sense to me and I think we’re still in for a lot of answers in the second half of the season. The only thing I even really liked about the entire episode was their hair after the time jump. If anyone can hook me up with Ali’s hair, I’m super interested. Also, it looks like Ezra and Aria are together and shopping for furniture, so thank you for looking out for me at some point, writer's room. Other than that, I guess I’ll just have to comfort myself with the hysterical reactions across the internet of people who understand how disappointed I truly feel. Until the next episode, my little dolls. Tell me your reactions over on Twitter!